Let us introduce you to this week’s Open for Business featured shop. Seams Like Home is located in Anchorage, Alaska (population 300,000) and was established in June of 2002. AQR: What does a customer see first when they come into your store? How often does that change? Anderson: When a customer first walks in the door they usually pause and take in the wall of color. With our long Alaskan winters, bright colors are truly an inspiration. We display our new fabrics on rounders with lots of signage and samples. Our displays are constantly changing and we rearrange the fabrics often. Seams Like Home has a unique variety of classes ranging from hand embroidery to machine software and everything in between, so we have samples everywhere. The main room is filled with our fabrics and we have a side area that focuses on sewing machines. 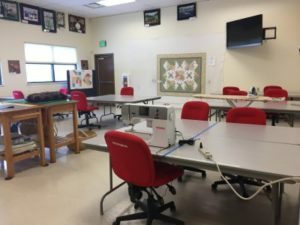 We are a Bernina and Juki Dealer and offer certification classes where customers can be trained to use the Bernina Q24 long-arm, and then rent the machine to quilt their own projects. We have two Bernina Q24 long-arms set up. My daughter, Enjoli, is the owner of her own business, Doodle Quilting Studio, and she teaches the long-arm classes, does private quilting as well as quilting the shop samples. AQR: What were your fears when you first began? How did you resolve them? Anderson: When I first decided to open a shop, I was in my 14th year of teaching elementary school. I knew that I wanted a second career and the timing was such that a local quilt shop was going out of business and while not the ideal timing since I already had a career, I knew that if I didn’t take the chance, someone else would. I drafted a business plan and by the time it was completed it had grown to a 3” binder filled with ideas. I recruited retired school teacher friends and opened for business. I would go to the shop between 6-8am and then head off and teach school until 4pm. I figured if Seams Like Home was not a success, I could always continue to teach elementary school. Instead, Seams Like Home grew quickly into becoming Alaska’s largest quilt shop! After renting several different locations, we finally decided to build our own stand-alone retail building in 2014. Our building is 6500 sq. ft. and features a large classroom with a kitchen, storage room, sewing machine repair room, a beautiful retail sales floor, sewing machine area, long-arm area and a nice back office. I designed it neutral enough that any business could rent the building if I decided to close the quilt shop. The building and quilt business are owned by separate LLC’s, so I can sell the business and maintain the building. Again, it was a built in safety net. My husband and I own the shop, but we are currently in a transition period where we are selling the business on to our adult twin daughters, Angelyn and Enjoli. This has been an ongoing adjustment and not without some pain. As a first generation business owner, this shop is my baby, but I am learning to let go and trust the talent of my daughters. AQR: Which jobs do you expect employees to do? Which do you do yourself? Anderson: Seams Like Home has grown to have 15 employees, both full and part-time as well as three sewing machine techs. I am getting better at delegating and not micromanaging. The key is to surround yourself with good people and they will make you look good too. My team includes, published authors, national teachers, award winning doll makers, unique bag makers, long-arm quilters, and embroidery software gurus. My expectations are clearly laid out for my team. We have processes in place for everything in the shop. With so much going on, we are constantly improving our communication strategies and stream lining our policies. We have a detailed handbook and check lists, so nothing gets lost in the shuffle. We had designated kit creators, sample makers, teachers, and clerks. We all take turns with cleaning the shop. I still maintain most of the accounting chores in the business. I like to know where the money is which keeps us current on our Open To Buy strategies. I am also the visionary and juggle twenty different event/classes/promotion ideas at a time. It is good that my daughter, Angelyn (manager) can rein me in to more realistic expectations and is constantly reminding me to delegate. AQR: How do you juggle family, business, and still find time for yourself? Anderson: My husband and I are early risers and I’m off to the shop by 6:30am. I am able to get a few hours of work in before the rest of the team arrives. I am constantly working on my time management and trying to reduce distractions. We both love to be home, so I am able to say “no” to social events without making excuses. My quilting has evolved and I am doing more fiber art pieces. I have a beautiful home studio where I can get lost for hours. My husband is an acoustic guitarist and song writer. He understands when I become totally absorbed in my need to create. My evenings are often spent listening to him play guitar in the kitchen (great acoustics) and doing hand work in the living room. My daughters have given me four beautiful grand-loves. My focus is sharing my time with them and since my daughters are a big part of the business, I am able to do this. AQR: What are your biggest frustrations and joys as a shop owner? Anderson: Let’s get real here. I love my employees, but they can be both a frustration and joy. I don’t enjoy managing people. I have heard before and often think, “To be unclear is to be unkind”, so I try very hard to be transparent with my team and they know my expectations. My current team is full of very capable, talented individuals and we work well together, but again, it’s because we have clear expectations and a detailed handbook. I use to get frustrated because they couldn’t read my mind…now it’s all down on paper. Seams Like Home has a strong presence in our community. We have monthly challenges and invite customers to make useful items for our community. We’ve donated dog beds, pediatric caps, NICU baby blankets, fidget quilts for Alzheimer patients, and wool mittens to the homeless. It is a joy to give back to the community I live in and it is part of our mission statement. Our customers range from new moms and beginner sewers to seasoned quilters and fiber artists and everyone in between. In order to reach everyone, we use Facebook, email and Instagram and old fashion snail mail to keep our customers informed, educated and entertained. We are known for our education/entertainment and have hosted many national teachers; Ricky Tims, Judith Baker Montano, Angela Walters, Sue Spargo, Kathy McNeil, Cynthia England, Gail Garber, Sylvia Pippen, are just a few of the teachers that we’ve had at the shop. I have a notebook full of ideas and classes and have a five-year calendar to schedule national teachers. AQR: What would you tell a new shop owner? Anderson: Create an employee hand book immediately. Even if it is only a few pages to start with, you need to have your policies and expectations written down. Hire slow and fire fast. In the past, I had a tendency to do the opposite and have finally realized that my shop is not always the best fit for people. It is easier to take the emotion out of a difficult situation if there is a handbook to refer to. Don’t treat your business like a hobby. A hobby costs you money and a business makes you money. The first few years I didn’t have my finances organized and would often use personal money to float the business. Be strict with yourself and keep personal and business finances separate. “Stay in your own lane”. I say that a lot to myself when I want to be everything to everybody. An example; We brought in yarns and tried to also be a knitting store. We were mediocre. Focus on your passion and become the best at that. My passion is quilting and education. Create your own peer tribe. Network at markets and establish relationships with other shop owners that are in different parts of the world. Having a group of colleagues to use as a sounding board and share ideas is so valuable. Read Read Read! There are so many fantastic business books to help organize your thoughts. Entreleadership by Dave Ramsey, Profit First by Mike Michalowicz, Thou Shall Prosper by Daniel Lapin, Boundaries by Dr. Henry Cloud, anything written by Seth Godin are just a few. Invest in yourself by reading. Yes, I would do it all again. It has been a wonderful, exciting journey! As a team, we’ve established a creative space that truly “Seams Like Home”.